Last night, the 24th Annual Minnesota Book Awards were held in St. Paul. I’d learned back in January that WITH OR WITHOUT YOU was named with three other finalists for the Young People’s Literature category. That alone was stunning, especially seeing the company I was keeping: Pete Hautman, Jacqueline West, and Kurtis Scaletta. All truly outstanding writers. Never did I dream I’d be included on a list with three such distinctive authors. Subsequently, I didn’t think I had a snowball’s chance of actually winning. And if I’d only made that finalist list, dayenu. 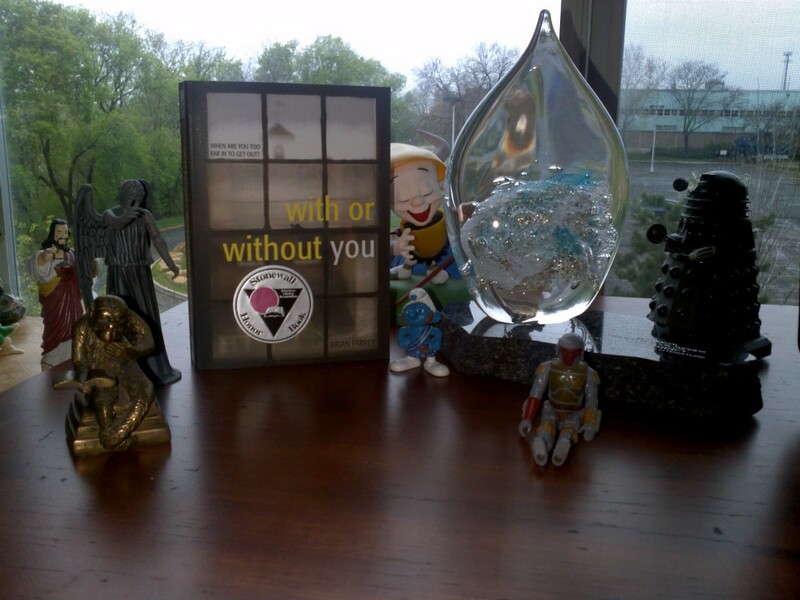 That beautiful piece of custom-made glass you see is a Minnesota Book Award. Mine, apparently. That’s what I’ve been told. There’s still a chance, I suppose, of some nervous looking person showing up on our doorstep, claiming a terrible mistake was made. But until then, it will be guarded by my little friends up there. In all seriousness, this is very overwhelming and I’m sincerely grateful to the judges and the Friends of the St. Paul Library for this honor. And congratulations are due to Kurtis Scaletta, whose book THE TANGLEWOOD TERROR was given the distinguished Readers’ Choice Award. You should read that book. And also the other books nominated in this category. I’m not kidding: they all rock. Let me tell you about my friend Ann.